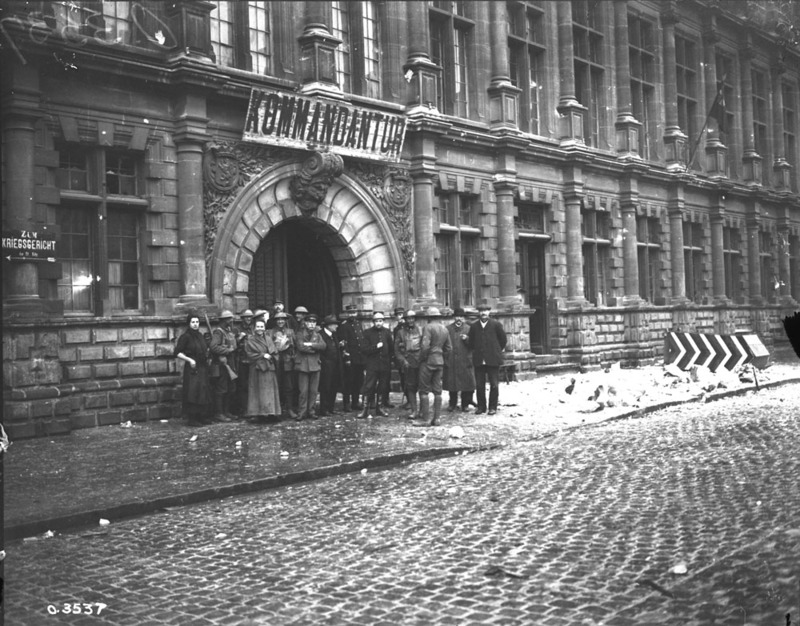 After a general retreat through October 1918, the German Army decided to make a stand in Valenciennes, a strategically-located city of several thousand French civilians, and the last major French city still under German control. The German commanders believed that the Allies would not bombard a city full of French civilians, and further consolidated their position by flooding the area around the city. On October 27, General Horne, General Currie and the British 22nd Corps Commander discussed the best way to take Valenciennes. They decided that they needed to take Mont Houy, a fortified hill overlooking the city first. The plan was for the 51st Division of the British 22nd Corps to take Mont Houy and press on to the sunken road (the “Red Line”) on October 28, then the 4th Canadian Division would pass through the 51st and take the “Blue Line” which included the outskirts of Valenciennes. Then on November first, the Canadian 4th Division would take the high ground to the east of the city, to allow the rest of the Corps to cross the Escaut canal and take the “Green Line”, which included the city. On October 28, the 51st Division failed to reach the Red Line in the face of strong German opposition, but by night they held most of the southern slope of the hill, le Poirier Station and the village of Famars. As a result, the plan to take Valenciennes had to be revised, and quickly, since the city was a key point in the left flank of the major British offensive scheduled for Nov. 3. The Blue and Green lines were thus merged into one operation for the 10th Canadian Brigade, backed by mass artillery and supported by the 49th British Division on the right. The Brigade would assault Valencinennes from South to East, and the 12th Canadian Brigade would do the mopping-up after crossing the Canal de l’Escaut. The new plan was set for November 1. On the night of October 29 the 47th and 44th Canadian Battalions took over the British lines, and sent out battle patrols to reconnoiter enemy positions and barbed wire. In preparation for the battle, the Canadian Corps Heavy Artillery was ordered to bombard the German positions day and night. The 10th Infantry Brigade alone had over 250 field and siege guns in support. One major complication was the presence of many civilians still in the city. The army wanted to spare them from heavy shellfire, and therefore focused on targeted attacks on known German military strongholds, such as the nearby village of Marly. The first objective was Mont Houy, for which was prepared a unique artillery barrage with frontal creeping barrage, enfilade fire and oblique fire. Also heavy artillery support from across the canal (the pieces could not yet cross). Two machine gun battalions were also in support, while other artillery provided a smokescreen for the attack. The Canadians also invested manpower and almost fifty guns in an extensive counterbattery to find German machine gun nests in buildings in the city and bomb them, and to take out enemy artillery pieces. The days preceding the attacks, as well as November 1 itself, had terrible weather,and when . the soldiers of the 44h and 46th Battalions started out of their positions at 5:15am on Nov. 1, they did so under the pouring rain. The Canadians advanced quickly behind a rolling barrage, but were forced to put on their respirators due to German gas shells. German artillery fire, however, was weak, both as a result of the effective Canadian counterbattery actions of the previous days and poor quality shells. 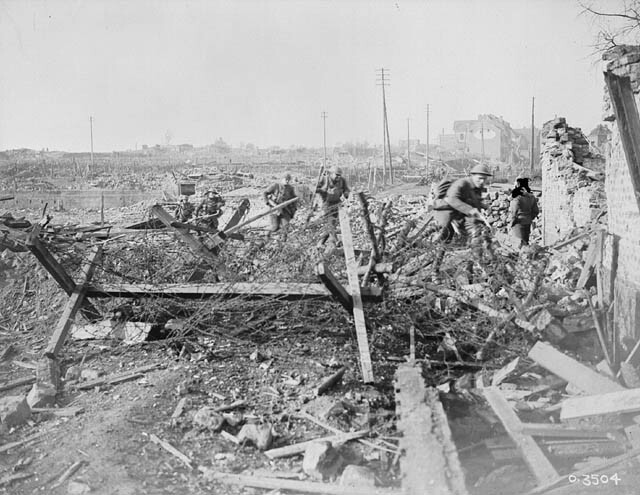 At the end of the day, the Germans were still in some parts of the city, but were pushed out gradually throught the night by the Canadian 12th Brigade. The 54th Battalion attacked the village of Marly on the morning of November 2, but discovered when they reached the village that the German Army had already retreated. By 8:30am, the Canadians were through to the far outskirts of the city and by the end of that day had completely taken the city. . Casualties: German: 1800 captures, 800 killed. Canadian: 80 killed, 300 wounded. The German killed-to-captured ratio, which was unusually high, has been a matter of controversy ever since the battle. 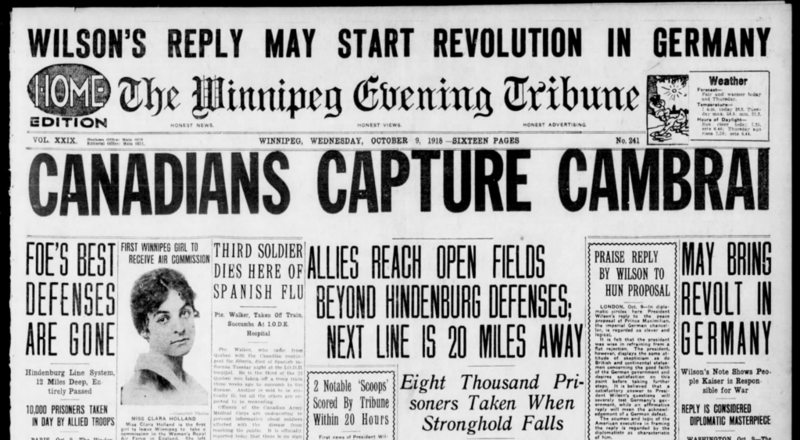 Some say that Canadian soldiers were less willing to take prisoners after 4 years of fighting, and especially after seeing how badly the local French populations had been treated by the occupiers. 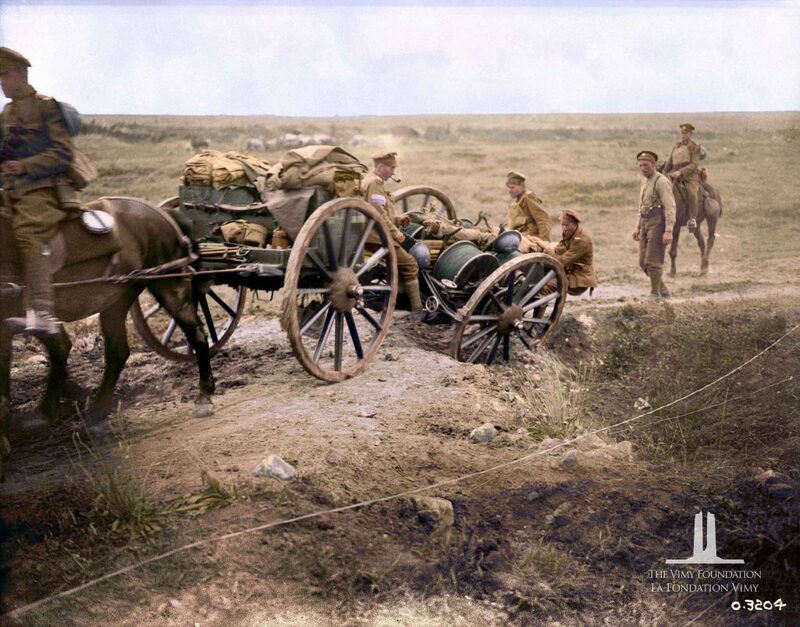 Technological Advancements: The main technological innovation was the overpowering artillery barrage which marked the most artillery support for a single Canadian brigade in the entire war. Strategies: The key strategies that made Valenciennes a success despite the odds were taking the high ground outside the city (Mont Houy) first, and massing the artillery to use for barrage, fire from three sides, counterbattery and targeted strikes. 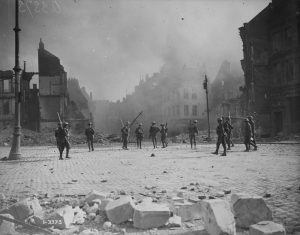 The battle of Valenciennes was also one of the few examples of urban combat during the war. Miltary commanders had been trying to avoid it, with General Currie in particular worried that the Canadian Corps had not been adequately trained for urban warfare. Notable People: Sergeant Hugh Cairns of the 46th Battalion already had the DCM, which he won at Vimy. At Valenciennes he received Canada’s last Victoria Cross of the war by single-handedly charging two machine-gun nests. He was wounded late in the day on Nov. 1, and died of his wounds the next day. Canadians with French Gendarmes and civilians outside the Hotel de Ville, Valenciennes. November, 1918. Credit: Canada. Dept. of National Defence/Library and Archives Canada/PA0-3445. We are proud to have worked with Edmonton, AB’s Armistice100YEG Committee on this beautiful video for the centennial anniversary of the Armistice. They have produced this video to reconnect Canadians to the history of John McCrae’s famous poem In Flanders Fields. Through the narration of the poem, and the combination of animated colourized archival images from The Vimy Foundation and Canadian Colour mirrored with contemporary footage, the video offers a dynamic and reflective look into the past, and an opportunity to engage with the history of service and sacrifice of Canada’s military during the First World War. The French version is in production and we will share as soon as it is completed. // La version française est en production et nous la partagerons dès qu’elle sera terminée. On September 28, 2018, Dr. Lee Windsor spoke with assembled guests at the Beaverbrook Art Gallery in Fredericton, NB about Canada’s Hundred Days campaign and the events taking place in France exactly one hundred years earlier. After retreating from the Drocourt-Quéant Line, the German Army withdrew to their final defensive lines in the Hindenburg system. The sector along the Canadian front included the city of Cambrai, an important logistical centre for the Germans, the Canal du Nord, and Bourlon Wood, a fortified defense position. For nearly a month after their victory at the D-Q Line, the Canadians waited, while Currie planned how to get the Corps across the canal, through the wood and onward to Cambrai. Canadian Signal Section laying cable. Advance East of Arras. September, 1918. Canada. Dept. of National Defence/Library and Archives Canada/ PA-003080 (modified from the original). At 5:20 am on 27 September, the creeping barrage opened up and the initial advance of only four Canadian battalions went forward across the canal du Nord. They reached the other side successfully, and more battalions began to leap frog over their positions, slowly moving forward and fanning out to objectives along an over 9000m front. The successes throughout the Hundred Days campaign came at a heavy cost for the Canadian Corps, incurring over 10,000 Canadian casualties in the Battle of Canal du Nord and the advance on and liberation of Cambrai. 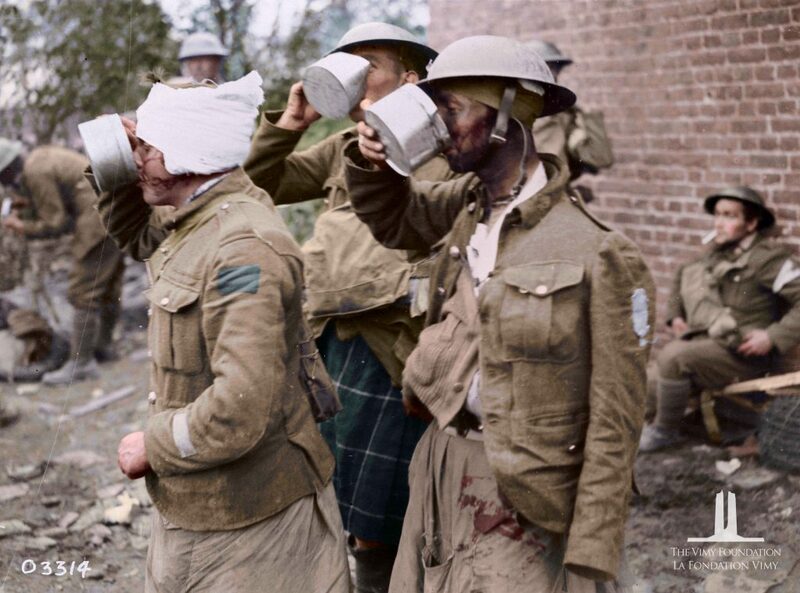 Canadian wounded enjoying a cup of tea at Advanced Dressing Station. Advance East of Arras. October, 1918. Library and Archives Canada/ PA- 003192 (modified from the original). We remember the actions of Milton F. Gregg, VC during the Battle of the Canal du Nord. “The outstanding valour of this officer saved many casualties and enabled the advance to continue.” Read the full citation of his Victoria Cross. Find his attestation papers at Library and Archives Canada. Milton F. Gregg, VC. Photo: Library and Archives Canada PA-004877. – The actions during the Hundred Days Campaign and particularly here on September 28 are described as happening very quickly. The Canadian Corps is moving forward without much time to plan, prepare, and bring supplies. How did this differ from other battles of the First World War? – At Vimy, soldiers waited in chalk tunnels underground prior to the battle; here, we hear how soldiers ‘rested’ in mud holes, waiting to attack. What do you think was running through the soldiers’ minds at night? – This page contains two photos that have been colourized. Use the Vimy 100 in the Classroom guide on ‘Photography in the First World War‘ to analyze the photos and the addition of colour. – When studying the First World War, students generally encounter the same four battles: Ypres, the Somme, Vimy Ridge and Passchendaele. While each was certainly critical to the war in its own way, Canadians served and made sacrifices in other, lesser-known battles, like at Canal du Nord and Cambrai. Use the Vimy Foundation’s resources from “Canada’s First World War Battles” and make a case for which battle was the most significant for Canada. 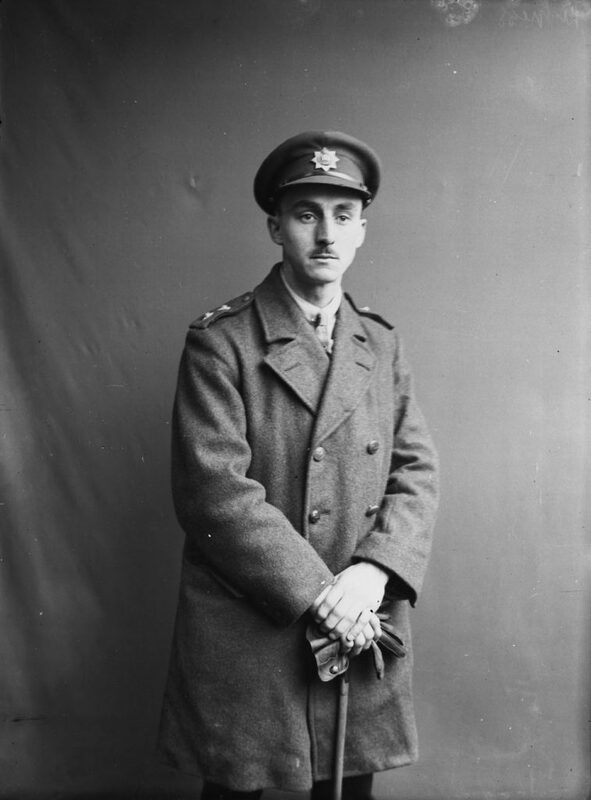 – Milton Gregg was awarded the Victoria Cross for his actions during this period, the highest award in the whole system of honours and awards in the British Empire. Do you think it was deserved? Why or why not? Find the full list of Canadians who have received the Victoria Cross at Veterans Affairs Canada. – The Victoria Cross belonging to Milton Gregg is now on permanent loan at the Royal Canadian Regiment Military Museum. In Canada, military medals and decorations are bought and sold regularly and there are no rules against it. Is this practice wrong? Why or why not?